With Mother's Day and my anniversary happening last weekend, I received many beautiful gifts of flowers. 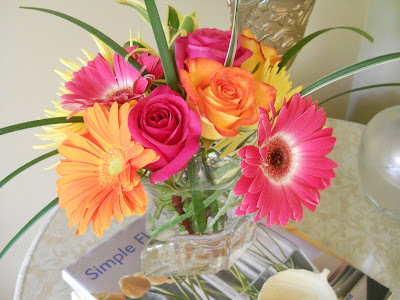 My husband bought me ( with some help from my daughter) a bright sunny bouquet without a tropical flower in sight! They were beautiful! And for Mother's Day from my kids ( also selected by Michelle ) , I received this colourful arrangement of roses and gerberas. Stunning! And then my sister from Kingston arrived with 2 bunches of soft pink tulips which I arranged in a white pitcher - lovely! Thank you to everyone for the flowers. I love them all!